This photo was apparently staged and shot on a beach in France, for a greeting card in the 1980s. It involved a couple of lights, as well as the models, wardrobe, and a CJ-3B with an eye-popping paint job. The original text had been cut off the card, so we needed a new caption. Congratulations to Gary McCourt, who won the caption contest on Facebook. The location might be identifiable by the distinctive little island visible in the background; does anybody recognize it? Roger Gaisford sent this photo in 2018, saying, "My 3B at Amatikulu Beach, Zululand." The Visit Zululand website says Amatikulu Nature Reserve is situated on the eastern coast of South Africa, at the confluence of the Matikulu and Nyoni Rivers. The Reserve has no dangerous animals, but there are over 300 species of birds, and healthy populations of giraffe, zebra and impala. Humpback whales are often seen from an observation tower overlooking a magnificent stretch of coastline. Despite the reassurance about dangerous animals, the website advises, "To get to the beach, you can either paddle there or walk next to the Matikulu River and wade through the Nyoni, but be warned that crocodiles have been sighted in the river. The beach is long and empty with crashing surf and a sense of complete and utter isolation." 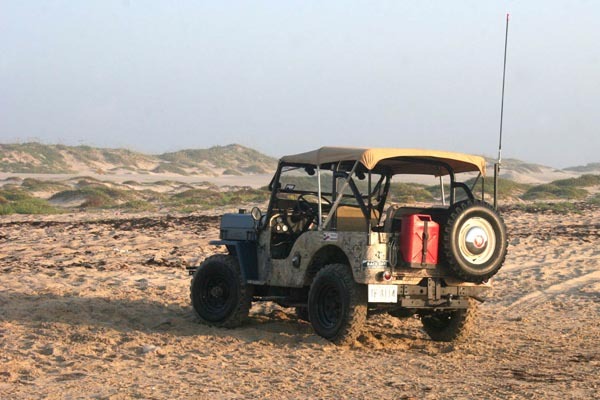 See more on Roger's Jeep in Exploring Zululand in Old Willys Jeeps on CJ3B.info. Jamie Powers in Houston wrote in 2014, "Last summer when I took my 1963 CJ-3B up to Colorado, some issues with what I thought was alignment or tires ended up being a weak frame. When I got home I had a bad case of death wobble, and realized I had a cracked frame. So I tore down the front clip. Repaired and reinforced the frame, rebuilt the steering box, replaced the springs and sandblasted / painted the front clip while I had it off. 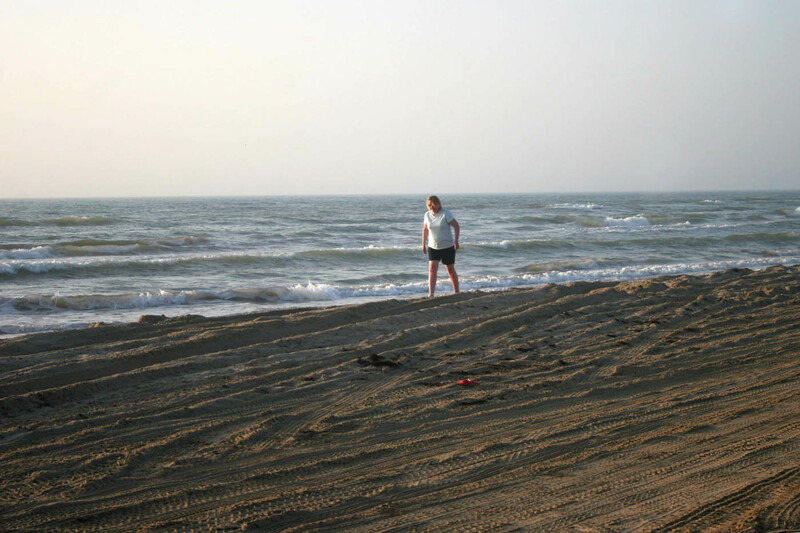 "This summer we booked reservations on South Padre Island; besides the resorts and tourist traps, South Padre Island National Seashore hosts over 70 miles of undeveloped beach. 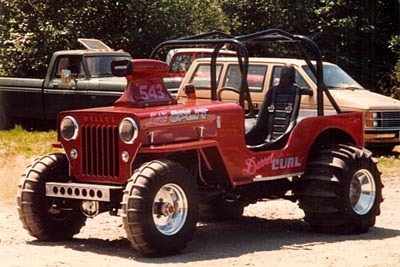 When I first told my wife Ann that I wanted to tow the Jeep with us to do a shakedown trip, she was not real happy. But she has a seashell fetish, and I reminded her that the further up the beach, the better her finds would be, and she agreed. Saturday we did the water park, and Saturday evening we did a short drive up the beach during low tide with hundreds of other vehicles, most of them two-wheel drive. "Sunday morning, my wife and I took off and drove up the beach for two hours during high tide. Stopped a couple times for the wife to look for seashells. There were a lot less vehicles, and a few stuck and abandoned ones caught by the tide. 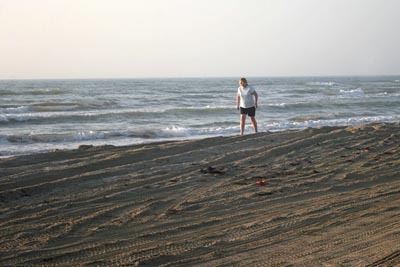 Above the high tide line, the sand is very loose and the only way you can traverse it is in 4-wheel-drive. Had a great time and my wife even told me she was glad that we brought the Jeep. I was very pleased how the Jeep handled. No more shimmy or death wobble and the 4WD worked great." 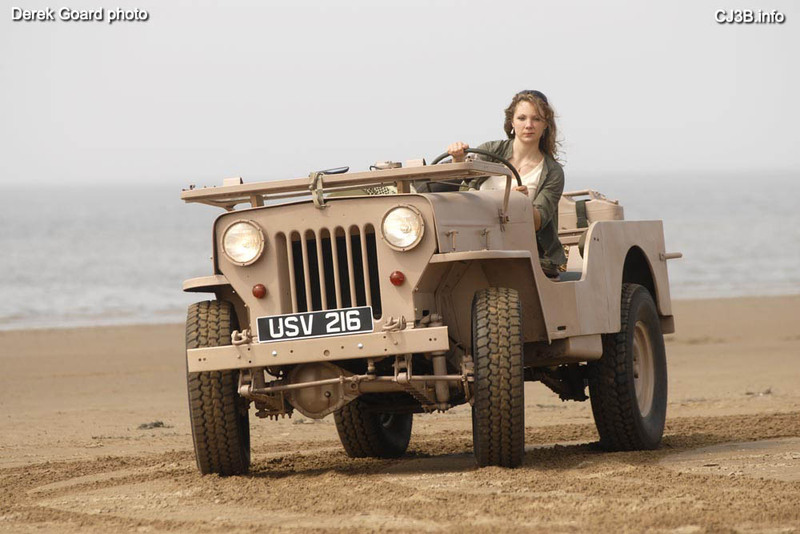 Our Summer 2007 cover photo for CJ3B.info was shot on the beach at Weston Super Mare in England by Derek Goard. Ros Woodham was driving John Carroll's project, the "Beer Truck." John says, "So-called because that's what we'd been drinking when we decided to save the derelict truck from a farm in Scotland, rather than use it for spares! It's based on the LWB CJ that appears briefly in Sahara. "It has Hotchkiss M201 wheels and front fenders, Viasa windscreen, and 1991 Mahindra CJ540 LWB tub, chassis and Peugeot diesel. Willys MB back panel, M38A1 dash panel, recovery eyes and tow hitch. CJ-2A seats, and repro MB wheel. 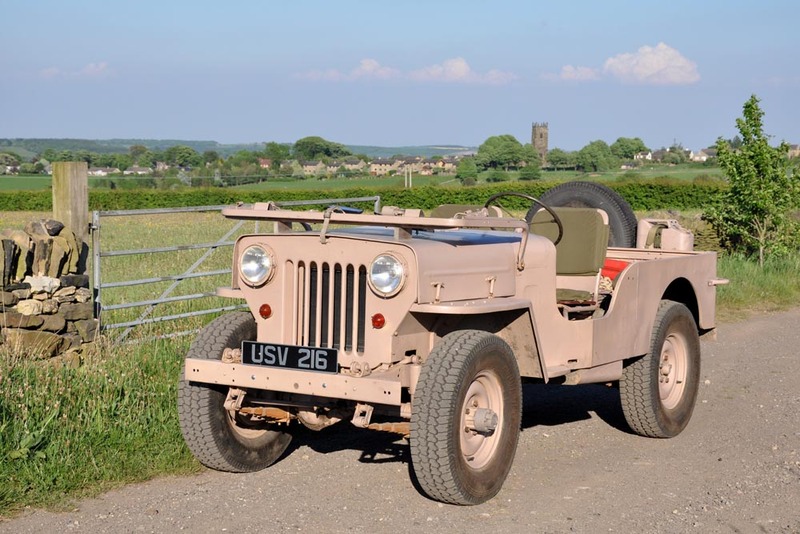 Converted to LHD with CJ-2A steering box and track rods. NATO-spec headlights, repro Model A taillights, and hood blocks made to measure (from dimensions on CJ3B.info)." See also a photo taken on a summer drive (150K JPEG) near Emley, West Yorkshire, and if you need to be reminded about what lies ahead when summer is over, see an earlier photo of the Beer Truck in the snow (160K JPEG). James May of TV's Top Gear took the Beer Truck for a drive in 2013 in The Worst Car in the World?. See also a toy version of the Beer Truck in 2015 Diecast CJ-3B Models. 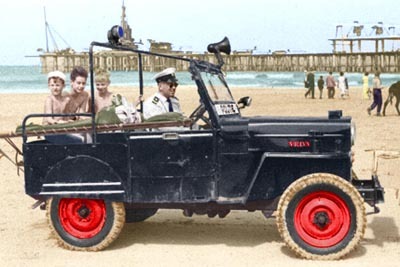 This wonderful shot dates from 1960, and shows a Police Jeep patroling a beach on the North Sea near The Hague, Netherlands. 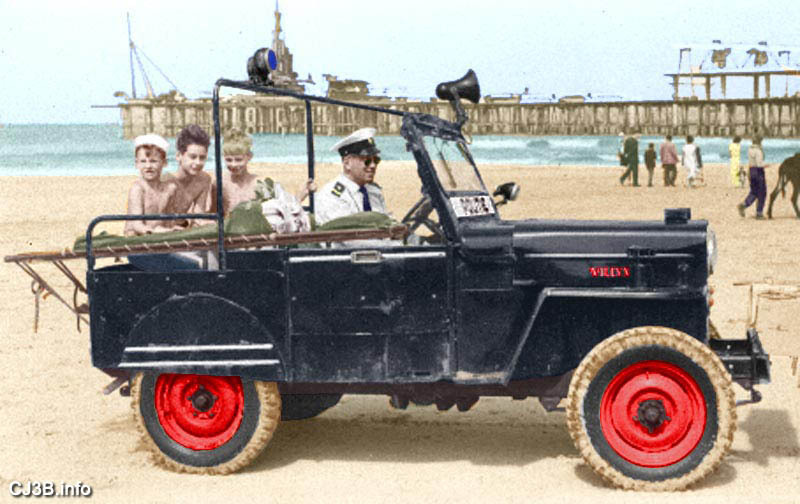 Behind the wheel is Cor Dijkema, the Hague Police officer who first proposed the use of Jeeps as beach ambulances. Thanks to Jan Hogendoorn who scanned the original black & white photo, which I colorized for the cover of CJ3B.info. See more details in Police Jeeps of The Hague, Netherlands. Here's an item found by Keith Buckley some time ago, and always fun to look at in the summer. My hand-tinted color version was also an early cover illustration for CJ3B.info. It's supposed to show President's Red, offered on Jeeps for the first time in 1955 -- but don't rely on it for paint information. The photo is from a May 1955 article (130K JPEG) in Willys Dealer News headlined "Teensters Call 'Jeep' Real George For Picnics." "Ever wonder where CJ-3Bs go to retire? This one used to belong to Jim Marski, but ended up on Nantucket Island as of June after being temporarily equipped with tires/wheels to cope with the deep soft sand." And talk about tires for the sand! Tom McHugh scanned the cover (left) of the July 2001 issue of Tripower, the newsletter of the Pacific Northwest 4WD Association. The photo is courtesy of T.C. 's Offroad in Kent, Washington. Obviously sand drags are popular on the west coast; Wes Kibble sent this photo of a CJ-3B named "Lickety Split" that was raced by Darrell Curl in BC and the PNW in the 80's. As Wes says, "Sweet looking machine!" 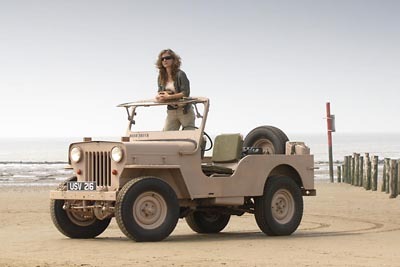 As of early 2009, Dave Strickler is the new owner of the earliest known CJ-3B with an OB54 serial number. 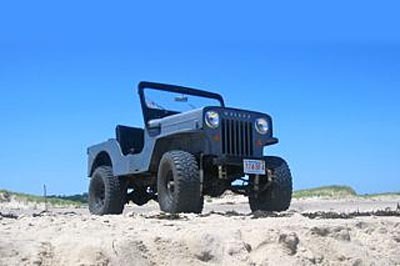 Dave lives on Cape Cod, so his Jeep is likely going to spend plenty of time on the beach. Bill Loomis in Elkhart, Indiana had nothing but sand dunes on his mind when he built this custom rig. He calls it his "CJ-3B" but says, "It's a glass body on a custom-built frame, with custom-built long travel suspension, a 215ci aluminum Buick v8, Chevy Turbo 350 trans, narrowed Scout 44 front, CJ-5 44 rear and Dana 18 transfer case. It has Jaguar headlights and a Corvette tilt steering column, along with hundreds of custom mods. I've had it 10 years and figured out Jeep stands for 'just empty every pocket'." Pavel Seidel posted this photo of his CJ-3B on the beach at Playa Barranco in Venezuela. Obviously the Jeep is set up for some serious fun, but we don't have any details on it. Roberto Rodetti provides a good view of the Dunlop AT2 31-10.5-15's on his 1954 CJ-3B. He says, "They give me great performance on tarmac and sand, but while mudding I prefer to use them with chains; they make the Jeep unstoppable." See also a view from behind (60K JPEG) of the Jeep attacking the dunes near Roberto's home in Buenos Aires, Argentina. 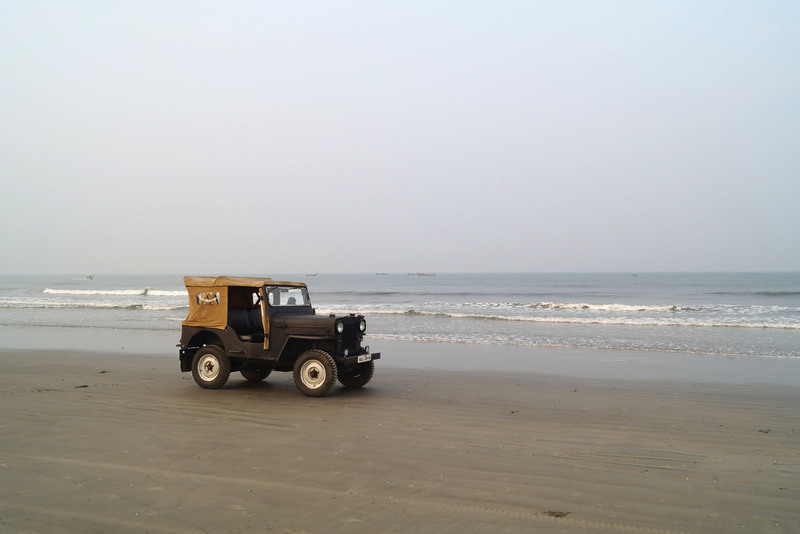 Nidhin Kurian photographed his Jeep on an Indian Ocean beach in Kerala, India in 2017. 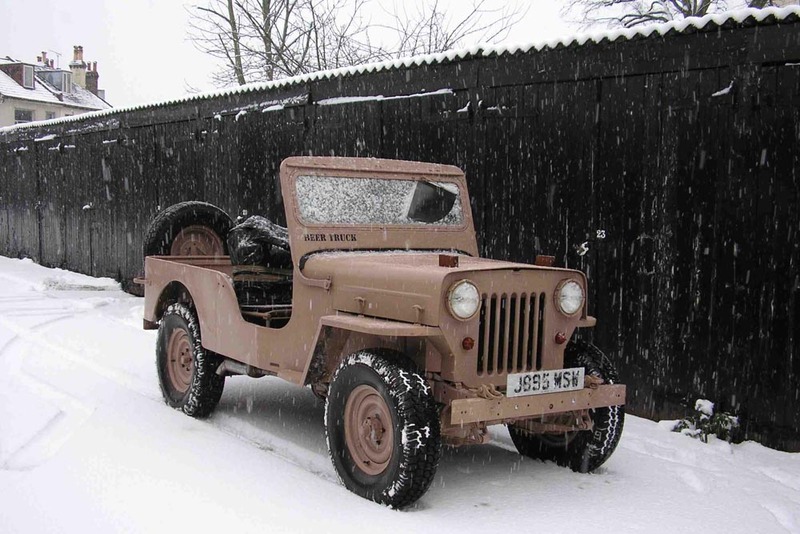 This 1961 Willys Jeep was one of many CJ-3Bs exported overseas for assembly, in this case by Mahindra & Mahindra in India. 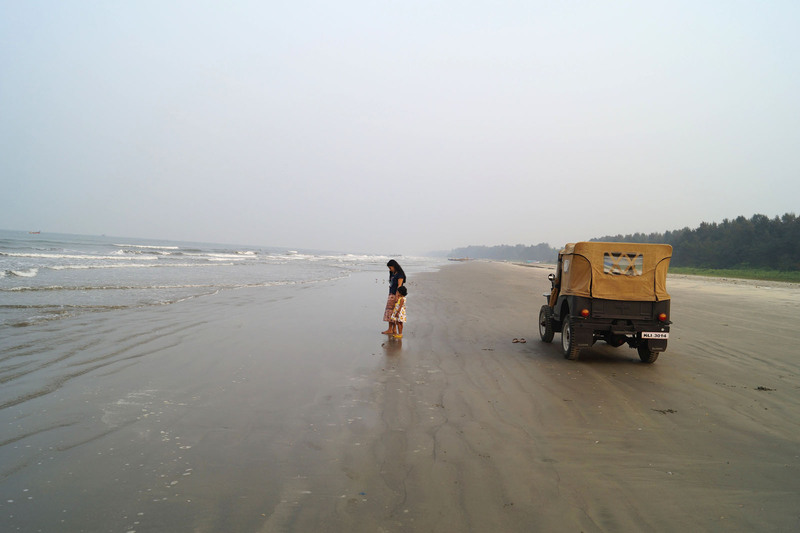 Beautiful photo by Nidhin of his family and Jeep on the sand. Kerala is near the southern tip of India. It's a couple of hundred kilometers south of Goa, the setting for our photos of a day in the life of a High Hood Lifeguard. 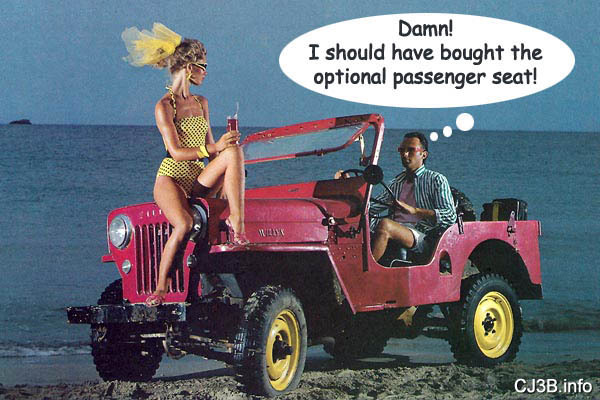 See also Willys Crashes Party at Jeep Beach and the 1961 Beach Car built by Willys Australia.